The arts and entertainment nonprofit Culture Candy has teamed with the advertisement company Lamar in a new community ad campaign written by Baton Rougeans themselves. “What does Baton Rouge mean to you?” That’s the question Culture Candy has posed to the community. The community billboard campaign has become somewhat of a trend in recent years, as a great way to express both unity and diversity across a city. The idea emerged from another Culture Candy community project, involving photos taken from around town. After conversations with a number of community leaders, the idea to start a dialogue on the billboards emerged. The idea is to think up two words that describe our fair city, one that starts with “B” and another that starts with “R.” The phrases will then be posted on a number of digital billboards, donated by Lamar, placed across the city. “One of my favorite submissions so far is about the Bucky Ford Railcardome – Quite a number of people will be familiar with that,” Webb said. The number of billboards varies, depending on the amount of free ad space that Lamar can utilize for the project, but there will be between 10-18 billboards, located from along the interstate to Perkins Rowe and Corporate Blvd., participating in the project, which will run for the next seven weeks. Need some help getting started? Grab a pen and paper, and check out these thesaurus-worthy words to get your mind turning. 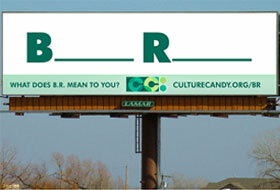 To submit your phrase, visit www.CultureCandy.org. The original article appeared on Dig Magazine's website. 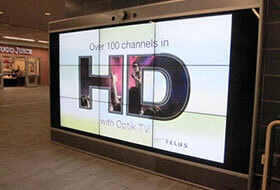 Lamar Transit Advertising and Monster Media Canada have launched a video wall in Vancouver City Station, which they say is the first large interactive liquid crystal display (LCD) array to be installed within any Canadian public transportation system. 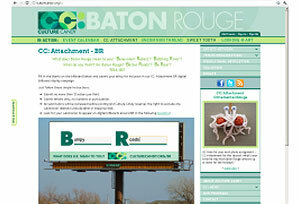 A new billboard campaign will allow the public to express what Baton Rouge means to them in 24 letters or less.